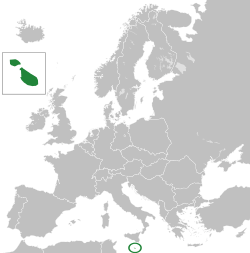 State of Malta in Dark Green. The State of Malta (Maltese: Stat ta’ Malta), known in common parlance as Malta, was the predecessor to the modern-day Republic of Malta. It existed between 21 September 1964 and 13 December 1974. The Malta Independence Act 1964 passed by the British Parliament transformed the Crown Colony of Malta into an independent Commonwealth realm with fully responsible government. 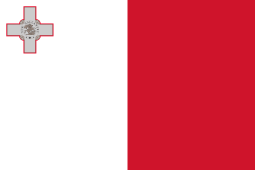 Under the new Constitution of Malta, approved in a referendum held May of that year, Queen Elizabeth II became Queen of Malta (Maltese: Reġina ta' Malta). The monarch's constitutional roles were delegated to the Governor-General of Malta. As Queen of Malta, Elizabeth II visited Malta once in November 1967. On 13 December 1974, following amendments to the Constitution by the Labour government of Dom Mintoff, the monarchy was abolished and Malta became a republic within the Commonwealth with the function of head of state vested in a president appointed by Parliament. The last Governor-General, Sir Anthony Mamo, was appointed the first President of Malta.